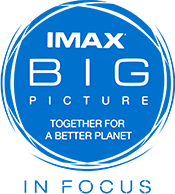 IMAX’s Corporate Social Responsibility (CSR) philosophy is to leverage its legacy of immersive experiences and storytelling to change our environment and improve all life on earth; and to offer new opportunities to more people to protect our planet for future generations. At IMAX, we believe that there are no limits to where filmmaking, storytelling and immersive experiences can take us. In our stories, we find examples of those inspired to envision a better tomorrow and the aspiration to use film to change the world. Based on this, IMAX saw an opportunity to be a voice for business in creating understanding and action for a more sustainable planet and we pledge our support of the United Nation’s Global Goals, which seek to eradicate extreme poverty, inequality and climate change by 2030. Educate (In Feature) - An ongoing series of educational screenings that showcase some of IMAX’s sustainability-related films to a global audience. Engage (In Focus) – A young filmmaker’s program which cultivates young filmmakers by providing educational opportunities and unique experiences to further their interest in filmmaking and pursuing a career in the entertainment industry. Learn more about In Focus here. Each of us plays a role in the increasingly interdependent story about global sustainability, which is why we are also partnering with organizations that will help amplify the message. Our partners include The United Nations Environment Programme (UNEP) and All American High School Film Festival.